Find the Right Bike! - Freedom Concepts Inc.
Freedom Concepts Inc. > Experience Freedom > Information for Therapists > Find the Right Bike! Each Freedom Concepts product is specifically designed to the rider’s individual needs, or for multi-user environments. Our custom approach allows us to ensure that every Freedom Concepts rider is comfortable and properly supported. This also allows our design team to build bikes around specific environments, whether it’s the addition of a TEC Drive to help therapists better assess the pedaling power of their clients, our new REC Drive for active special needs families, or specialized seating for added trunk support. Our products are designed to provide mobility, independence, and above all Freedom. Have your bike built with a wide-glide frame to further prevent tipping and to support heavier riders. Add knobby tires for easy-cruising down gravel roads, or equip devices with never-go-flat tires for maintenance-free riding. How Involved is the Rider? Are they able to control the bike on their own? Or would the addition of a Rear Steer Assistance Handle be beneficial? Our line of adaptive bicycles accommodates a wide range of heights and weights, allowing for a minimum of 6” of growth on every model. By sizing the bike to the inseam (leg length), you are fitting the individual so that they are not straining muscles and hindering development. Experience years of enjoyment and stimulating growth by ensuring your device is sized properly! Remember, our adaptive bikes accommodate functional inseams from 6 to 34 inches or more. Each model has a specific inseam range; however we always take factors like positioning and room for growth into consideration when building a Freedom Concepts bike. We custom-built a Tandem bicycle for Kyle and Brent Pease, for competitive use in triathlons across the country. 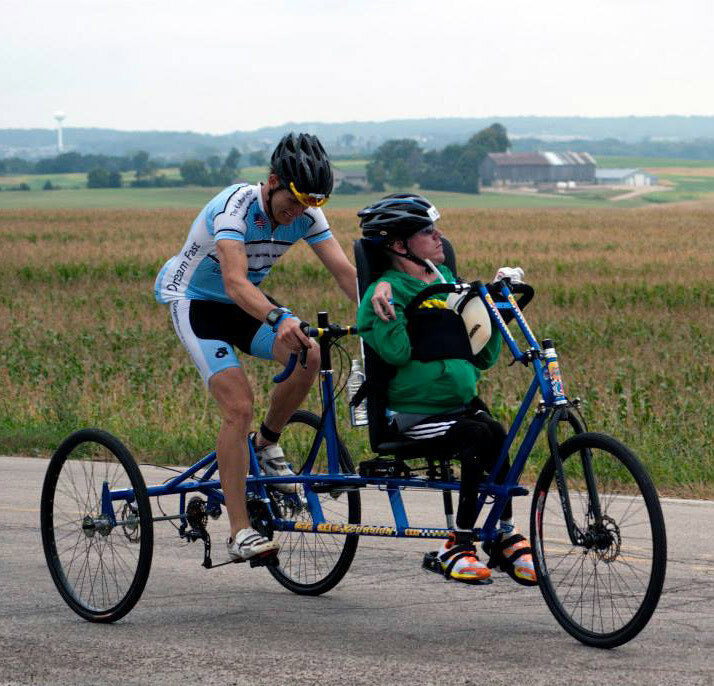 The brothers recently completed IRONMAN Wisconsin on the custom Tandem, riding 112 miles in nine hours. All Freedom Concepts products can be customized for an individual’s specific need or for multi-user environments. Most of our standard features started out as simple customer requests then as demand grew, they became regular features or options.